WARNING: If you do NOT wish to use Blackboard’s Attendance Tool, DO NOT CLICK on Attendance under Course Tools in the Control Panel menu. Clicking Attendance in Course Tools WILL generate a Grade Center column that cannot be deleted. The work-around, should you accidentally do this, is to edit the Attendance column to not feed into the Totals column, hide it from students, and hide it from the instructor view. We anticipate an update down the road that will, upon clicking Attendance, introduce an intermediate page with a button that will then generate the Attendance column. But until then, please avoid clicking Attendance in Course Tools unless you fully intend to use it. Should you have questions about the Attendance tool, you may request a consultation with an Educational Technologist. Blackboard Learn now has an Attendance tool. For each session, you mark students as present, late, absent or excused. 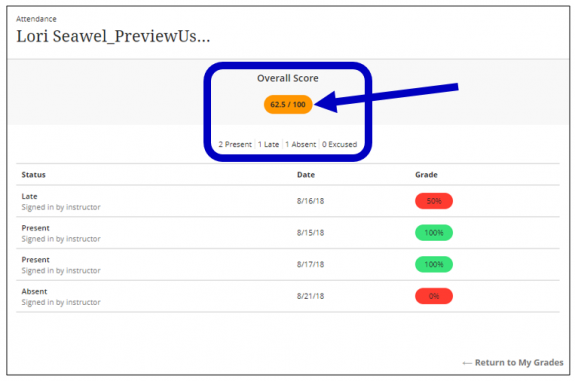 A column is automatically generated in Grade Center and can be included in a “Totals” column for final grades. Check out this video demo to get a brief overview. Regardless of how you choose to use Bb Attendance, through our early testing of the tool, we learned it is NOT A GOOD IDEA to change the points possible after you start taking attendance. This seems to freeze students’ report status going forward. If you use Blackboard’s weighted grading column, as with all grade-related columns, you will need to add the Attendance column to the “Selected Columns” list in the Weighted Total column and set the desired weight percentage. After activating the Attendance tool, edit the Grade Center column for Attendance. This will eliminate confusion for students as they will then see only a percentage when viewing their attendance records rather than points, which may confuse them. Select “No” for “Include this column in Grade Center calculations”. If the course instructor allows it, students can view their attendance history in My Grades (accessed via Tools in the student section of the Course Menu). As shown in the screenshot below, students need to click on either the All tab or Graded tab. Attendance will appear as a row in the list of graded items. The Attendance row gives the overall score (or Percentage if set as the Primary Display in the Grade Center Column properties). The word Attendance is a link that takes the student to their attendance history page. The attendance history page allows a student to see a breakdown of attendance records for each class session. An overall score is displayed at the top of the screen (noted by the arrow in the screenshot below) along with total sessions Present, Late, Absent, and Excused. For more information on the Blackboard Attendance Tool, visit Bb Instructor Help or request a consultation with an Educational Technologist.